In the first hours after the new Congress convened, a resolution passed the House that is a first step towards repealing Obamacare (formally known as the Affordable Care Act). Meanwhile, Trump’s sweeping promise to provide “insurance for everybody” has been dismissed by Republicans driving the repeal. To add to the confusion, there are numerous half-baked replacement plans floating around, too. The President-elect, his pick for Health Secretary, and Republican lawmakers can’t seem to agree on what comes next—or even on what they want to replace the ACA with. Under Obamacare, approximately 20 million Americans gained health insurance. According to the White House, the latest figures put the nationwide uninsured rate below nine percent—the lowest in history. The most basic premise underlying the ACA is that no one can be excluded from accessing insurance — even with a pre-existing condition — and that everyone must be covered, or face a penalty. Under the ACA, several states expanded Medicaid coverage for the poor and elderly. Republicans are eager for a “partial repeal and replace”, while significantly reining in the Medicaid expansion. If they’re successful, Western states that didn’t opt into the expansion — Idaho, Utah and Wyoming— would stand to lose the least if Obamacare were repealed; Montana would lose the most. Hover over each state to see more details. But as Republicans march a repeal through House and Congress, even the line between a “partial” and “full” repeal is murky. Right now, the funding legislation for the “full” repeal is only targeting certain aspects of the ACA. Specifically on the chopping block are individual requirements and employee mandates for health insurance that required employers with 50 or more employees to provide insurance, as well as the tax on individuals not buying insurance on the open market. The replacement plan would also likely cut tax credits and cost-sharing reductions. A Republican plan to do away with the ACA, whatever form it takes, is likely to have major implications. In January, the D.C.-based Urban Institute released a study on the impact of a likely repeal of Obamacare. Overall, the think tank estimated that nationwide, 29.8 million people would lose their health insurance. Across the West, nearly nine million people could lose coverage. A protest in 2010, led by Tea Party organizers, in Washington D.C., drew crowds that said the Affordable Care Act is unconstitutional. More recently, however, the Congressional Budget Office released an analysis of its own based on a model that would repeal the ACA in two steps: First, by removing the law’s penalties and tax credits, and then, by rolling back the Medicaid expansion. In its Jan. 17 report, CBO estimated that 18 million people would lose insurance in the first year under a partial repeal of Obamacare, while an additional 32 million people would lose their insurance once the Medicaid expansion is repealed. 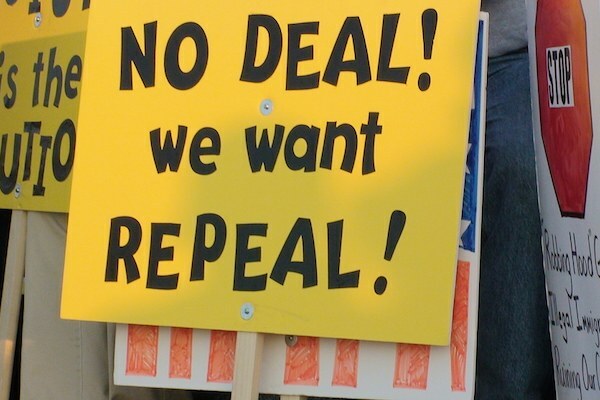 The Urban Institute study factored in the impacts of a partial repeal similar to the Republicans’ reconciliation plan that passed Congress last year but was vetoed by President Barack Obama. Had the reconciliation plan been able to clear its final hurdle, it would have eliminated the Medicaid expansion for states that opted in, removed open-market credits for those who couldn’t afford insurance, and rolled back requirements on employers and individuals. Since the health care law expanded Medicaid in 2013, 17 million people nationwide have enrolled in it as part of the expansion. Under the reconciliation plan, the poorest Americans would lose that insurance and be left in the cold. According to Kaiser Health News, rural hospitals could take a significant hit as well: Medicaid had provided new revenue for them, as they served a population that's typically poorer and experiencing greater health disparities. Such may be the scenario in Montana, where the insured population could take the biggest hit in relation to all other Western states. Under a repeal and replace, 142,000 people—or 14 percent of the state’s population—would lose insurance. The most vulnerable among those are the 61,000 Montanans who gained access through the state’s Medicaid expansion plan, according to a report by the Montana Budget & Policy Center. Additionally, more than 8,000 American Indians enrolled in the state’s Medicaid expansion plan could lose their coverage.